Oracle OpenWorld is an annual Oracle convention for business decision-makers, IT management, and line-of-business end users to learn about trusted products and up-and-coming technologies. Version 1 representatives were invited to attend Oracle OpenWorld in San Francisco from the 19th of October for the exclusive Oracle pre-advisory briefings and have been participating in talks and sessions throughout the week. In case you missed it, check out the first blog post from Ken MacMahon earlier this week to read about Major Oracle E-Business Suite Changes and How Oracle Cloud Compares to the Competition. 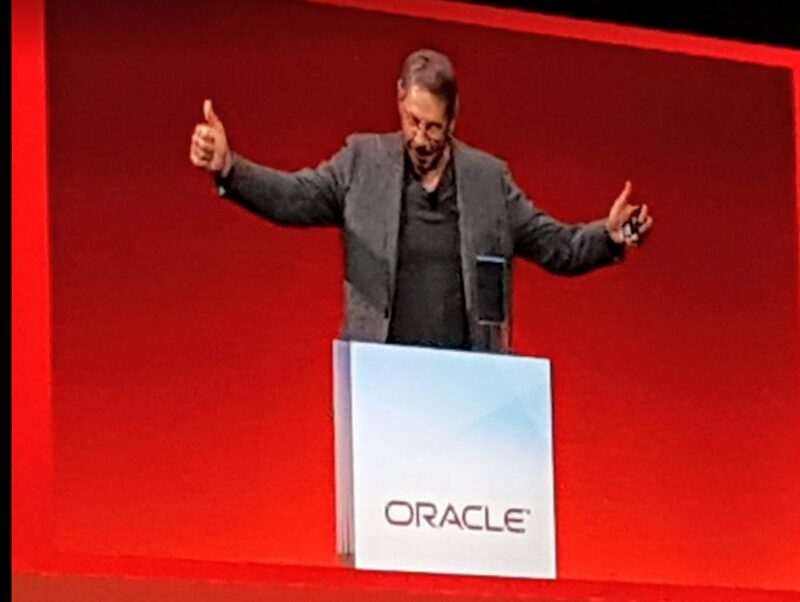 In what was a lively, upbeat and good humoured appearance at the Wednesday keynote, Larry Ellison presented lots of great insight on the direction and new features, including AI, Machine Learning and Voice UI, which are/will be powering Oracle’s Fusion Cloud Applications (ERP, SCM, HCM). In his presentation, Ellison clearly felt that Oracle are not seeking, but have market preeminence, and it shows. He quoted six thousand Fusion applications globally, quoting the competition being in the hundreds, accepting that in terms only of sales from Salesforce, were Oracle playing second fiddle. What added to the positive and feature-packed presentation, was the fact that the only reference to Amazon Web Services was some nice integration between (Amazon) Alexa and Oracle ERP Cloud. The focus was very much around business function and benefit, driven by Oracle’s Cloud Applications. Ellison stated, on a number of occasions, that Fusion Cloud Applications run on Oracle’s Cloud Infrastructure (Gen 2) thus giving the option and possibility to integrate many of the features mentioned in the Monday keynote, for example Autonomous Data Warehouse, into the extended Cloud Applications Suite. Now, how some of this is forward-looking and as per our thoughts in the last blog post, what exactly this means for Fusion Cloud Applications which are on Cloud Infrastructure (Gen 1) is one to ponder and would need a deeper dive beyond this quick update. So what did we see? Well, firstly for Voice UI a new feature, we saw the full (almost) co-operation of Alexa a user could integrate with the applications. 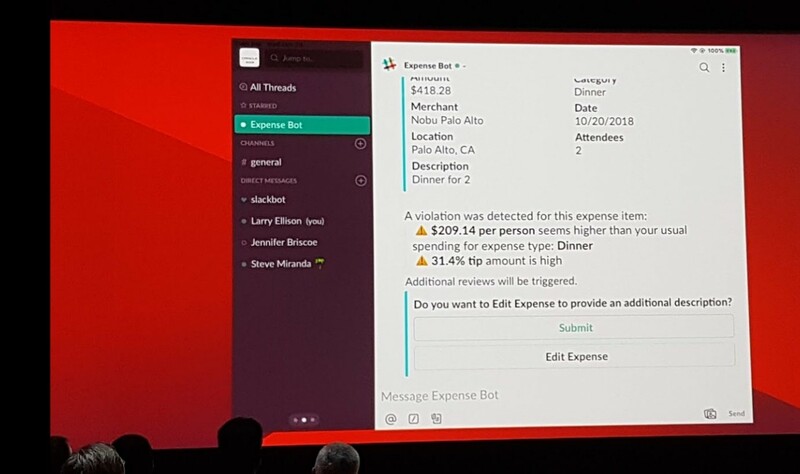 For Machine Learning, again in a fun demo, we saw how a highly automated and simplified expense entering capability through machine learning could pick up patterns in spending which might need attention. In the example, the machine learning had clearly not determined it was Ellison, and so determined a restaurant bill which had a cost per head of $209 was, perhaps, excessive along with a tip of 31%! We saw the Fusion Data Analytics Data Warehouse. This is where we see the clearest integration from Oracle across their SaaS and PaaS offerings on the new Oracle Cloud Infrastructure. Ellison demonstrated, what he insisted was a live demo, creating and populating a data warehouse with key data from the Fusion Cloud Applications to the Data Warehouse, essentially Oracle Analytics Cloud, in a couple of mouse clicks. Once built, the user can perform all of the analysis of their data as you would expect from any fully formed data warehouse and analytics tool. It is difficult not to return to the point that this was ‘live’. If so, the provisioning of the autonomous data warehouse, build of the data warehouse schemas, extraction and transform of the data from source to target, in the time during the demonstration was simply unbelievable. Finally, Ellison touched on the SOAR initiative which is available to support customers in migration from E-Business Suite to Oracle Cloud Applications. So all in all, a really strong and powerful demonstration of what is coming with Oracle’s Fusion Cloud Applications to bring value to customers. As I alluded to here and before, some of this may be forward-looking and the detail of the actual implementation of this may be a little more complex than demoed, but the direction is clear. Oracle is going all out with all the latest in Autonomous, AI and Machine Learning across SaaS, PaaS and IaaS – all built on their Oracle Cloud Infrastructure (Gen 2). Big thumbs up from Ellison for Amazon…. Alexa! Stay tuned for more updates from Version 1 from Oracle OpenWorld and don’t miss our last blog post: Major Oracle E-Business Suite Changes and How Oracle Cloud Compares to the Competition‘Ones to Watch: Version 1 at Oracle OpenWorld 2018’. The go-to partner for Oracle E-Business Suite, JD Edwards, Peoplesoft and Oracle Cloud Applications. We are committed to continuous innovation in Oracle applications and helping customers digitally transform through the next generation of Cloud applications.